Found in the wild in Southeast Asia, the Malaysian forest scorpion, or Heterometrus, is sometimes kept as a domestic pet. More aggressive than the emperor scorpion, less toxic than other scorpion family members and one of the largest pet scorpions available, the black forest scorpion is a solid choice for the Scorpiones enthusiast. The Malaysian forest scorpion -- also known as the Asian forest scorpion -- is one of a variety of family scorpions under the Heterometrus genus. These black pet scorpions are among the largest, reaching up to 6 inches in length. In the wild, these scorpions live under dry forest debris and can happily thrive in groups of three or more in captivity. Heterometrus have a lifespan of seven to eight years and feed regularly on crickets, meal worms, locust and small mice. Black forest scorpions are highly aggressive and less inclined to be handled than other species of scorpions. The Malaysian black forest scorpion will readily sting in defense if it feels threatened or in danger. Unlike other scorpions, such as the emperor scorpion, the forest scorpion will not likely settle down throughout its captivity. Due to its looks, size and temperament, the Malaysian black forest scorpion is a scorpion to appreciate visually; young children and pets should not engage the Heterometrus. 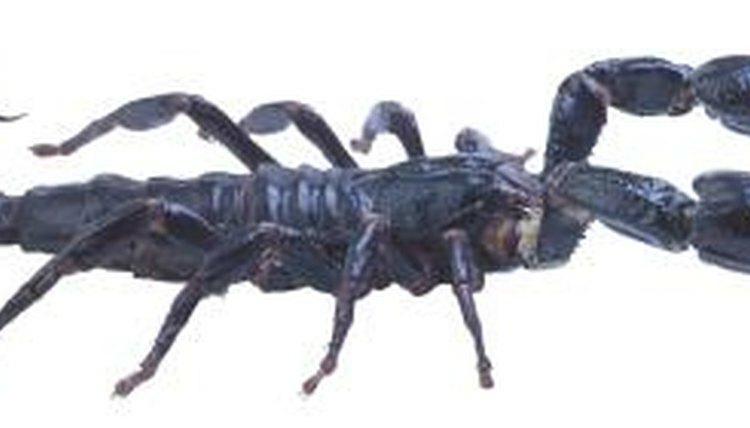 A grown adult would describe the sting of the Malaysian black forest scorpion as that of a large hornet. While not deadly, the sting can cause a great deal of discomfort: pain, swelling, redness and numbness in the extremities than can last several days. It's possible to experience shortness of breath and shooting pains from a black forest scorpion sting; these symptoms are common. However, if your eyes begin to twitch or you cannot breathe, go immediately to a doctor. There are antidotes available for scorpion stings. In most cases, a call to Poison Control to inform them of the sting is all you need to do. The symptoms of the Malaysian black forest scorpion should abate within a few hours, although some persistence of numbness and pain could last a few days. No known fatalities have occurred from the sting of the Heterometrus. To prevent being stung, provide your scorpion with plenty of hiding places within its tank and, if you must handle it, wear long, thick gloves. Alternatively, you can move your scorpion using a net.